This post contains affiliate links, which means that the price of the item won’t change for you, but I receive a small commission of the sale. This helps keep my site up and running. Thanks! With some exceptions, February has been kind of terrible. 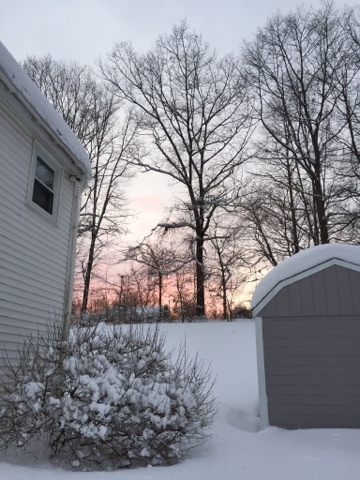 We had some family medical things happen (everyone’s doing alright now) and we had SO MUCH SNOW in New Hampshire that I missed four days of work because I literally could not get to the office and it has just been a rough, rough, rough month. I even considered skipping this month’s favorites because I just wasn’t feeling in the best of moods. But I’m also a huge advocate of finding the positives in life, and I feel like I really need to practice what I preach here. So without further ado… here are some of the awesome things I was able to experience and love this month! -Okay, so considering the weather and the fact that I was also sick for part of the month, these boullion packets have been THE BEST THINGS EVER. I know that sounds completely absurd, but there’s something about a hot broth when I’m sick that just totally hits the spot. -Another great thing for when you’re sick (or honestly anytime) is tea! I love tea year-round, but I recently was introduced to a new type at my friend Michela’s house and I am IN LOVE. Bigelow brand Vanilla Chai Tea is one of my new favorites, for sure, and something I want to pick up for our household soon. I swear, I have it every time I go to Michela’s and I’m starting to feel guilty for how many of her tea bags I’ve used! They’re honestly just delightful! 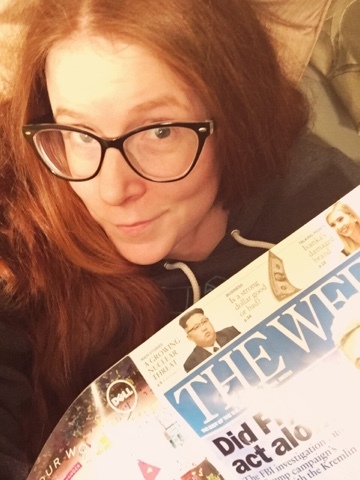 -I recently resubscribed to my favorite magazine of all time – The Week – and I just got my first one this month! The Week is a weekly magazine publication that goes over US and International news from the past week, citing a wife-range of sources and giving you basic information on current affairs. I like to describe it as Cliff Notes for the news, and I really love it! -Probably the biggest game this past month was the Superbowl! We actually watched it (whattt? I know, I was surprised too) and of course, being from New England, we were all pretty stoked about the incredible win from The Patriots! 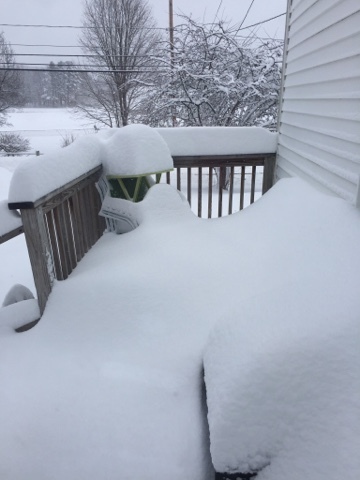 This is our front porch… Yeah, I’m not kidding about the snow…! -When I asked Chris about what his favorite was for the month, he mentioned a tv show we’ve been watching together. It’s called Timeless and it’s about time traveling! It’s a super complicated show to explain in written form, but suffice it to say he’s been really enjoying it and so have I! -Jessica’s favorite for the month? “Snow!” She had SEVERAL snow days this month, and a bunch of 2-hour delays as well. 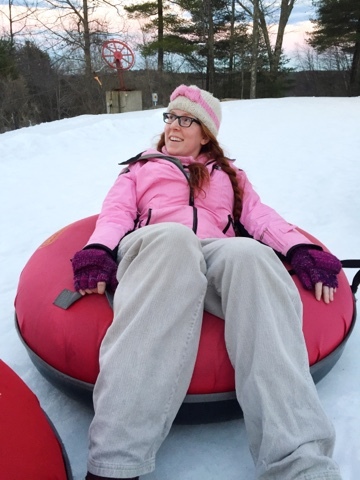 Although the adults in the house were certainly less-than-thrilled about the crazy amounts of snowfall we got in New Hampshire recently, Jess has been LOVING IT and has been able to go sledding with her friends and just generally enjoy the coziness of this time of year. -Aside from just being generally grateful for the health and well-being of my family this month, I did also manage to have a little fun in there. My friends Michela and Teddi and I were able to go TUBING!!! 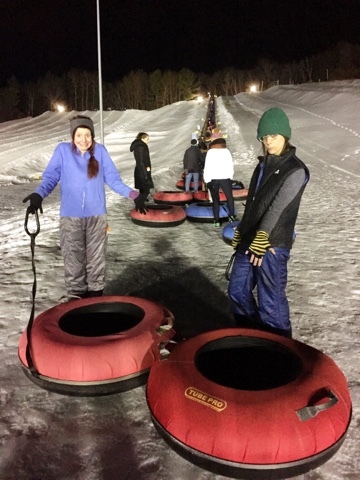 The tubing place was super fun – there were six lanes, great tunes, and a restaurant where we 100% ordered mozzerella sticks and cheese fries when we took a break from the rides. I had an amazing time and it was definitely a much-needed respite in an otherwise stressful month! What about you? 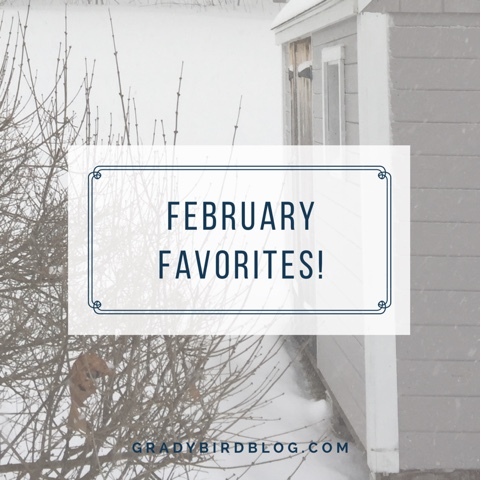 What has been your favorite thing or experience from February? I’d love to hear about it in the comments below! Hi, I’m Grady! Welcome to my blog 🙂 A little about me? I’m a smitten newlywed and brand-new stepmom living in New Hampshire. 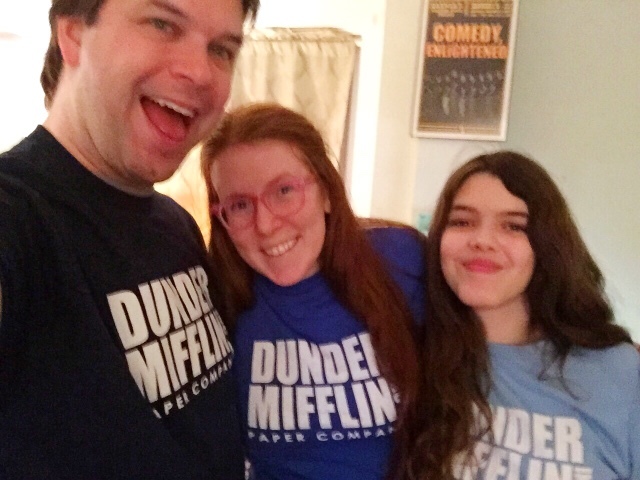 My day job is boring on paper but great in real life (just like Dunder Mifflin! ), and when I’m not working I love to spend time with my family, perform in or manage productions at the theatre, and eat ice cream while listening to yet another financial management podcast. 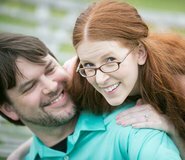 I write about my marriage, step-parenthood, and whatever else is going on. Be sure to follow me on Instagram, Facebook, Twitter, and Pinterest, and subscribe to my blog! « The Stepmom Club Series: Camille! I'm a wife and stepmama obsessed with dresses, planners, and iced coffees bigger than my head.